After reading the synopsis on the book jacket, I was really interested in this book. Set in Kenya, Tina must solve the case of her mother’s murder and then avenge her death. It sounded like an interesting thriller set in a unique culture, and I love reading books about other cultures so I had high hopes for it. In the end, I decided it was a 3.5 star (not quite a 3, but not a 4). I liked the immersion in Tina’s world. 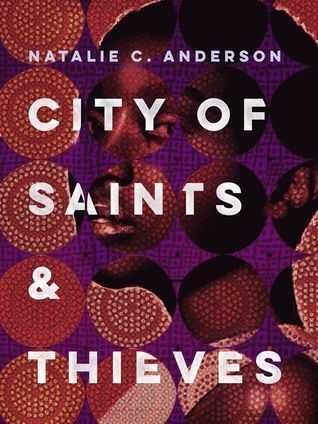 She’s become an expert thief and member of a dangerous gang in Kenya after her mother’s death in order to provide for her and her sister, and the whole world of crime and gangs in Africa is super fascinating. The character of Tina reminds me a bit of Inej in Six of Crows, and the Goonda gang in City of Saints and Thieves is reminiscent of Kaz’s gang The Dregs. I enjoyed those similarities. 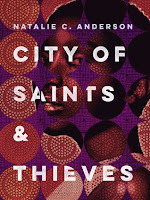 Natalie Anderson incorporates Swahili words in italics throughout the novel which gives it a sense of authenticity, and she provides an appendix in the back to explain them. I loved that. She reveals the situation of the people in the Congo through her characters, and shows how the strife and violence affects the individual. But I found myself wanting more about Africa, about the Congo and Kenya. I wanted more immersion in the culture, further details. Ultimately, this book didn’t earn a higher rating because it felt too much like YA lit. “Well, that’s ridiculous, that's because it is YA lit!” you say. Yes, but YA lit is often guilty of certain clichés and shallow dialogue/characters/story lines/etc. And this book was guilty of some of those things. I wanted more depth, and I think that if the book had been a little longer, this could have been better developed. Overall, it was a super intriguing read, and it makes me want to read more books set in Africa. I’m glad to see a culturally diverse book like this in YA lit and I hope it’s the beginning of many more to come.